A Quebec employer has become the second employer to be convicted of criminal negligence in the workplace death of an employee. Pasquale Scrocca, the owner of a Quebec landscape company, is facing jail time after an accident at a worksite on June 12, 2006. Scrocca was moving soil with a backhoe as part of a landscaping job when the brakes failed and pinned an employee against a wall. The employee died of his injuries. Scrocca was charged with criminal negligence causing death under the 2004 Bill C-45 amendments to the Criminal Code — known as the Westray Bill after the 1992 Westray mine explosion that killed 26 men — after it was discovered the backhoe had not undergone any regular maintenance since Scrocca bought it 30 years previously. An inspection found the backhoe’s front brakes and emergency brake weren’t working and there was no brake fluid. The horn, brake lights and brake pressure gauge were also non-functional. Scrocca argued he wasn’t aware of the backhoe’s braking problem as he hadn’t noticed anything wrong before the accident. 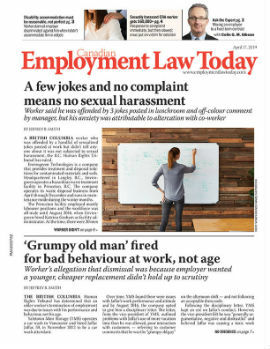 However, the court found the Criminal Code demanded an employer take reasonable steps to prevent harm to a worker. By not regularly maintaining the backhoe, Scrocca created the circumstances where he couldn’t be sure what condition it was in, which breached his duty of care, said the court. The court found Scrocca was guilty and sentenced him to two years less a day in prison. Scrocca’s conviction was the second in Canada under the Bill C-45 amendments, with both in Quebec. Cement manufacturer Transpavé pleaded guilty in December 2007 after a worker was crushed to death because a safety system on a concrete block stacking machine was disabled. Transpavé was fined $110,000. In a well-known Ontario case, a construction company and three executives are facing charges under Bill C-45 in connection with a scaffolding collapse on Dec. 24, 2009, that killed four workers and seriously injured another.